Wildlife Management Areas are open for hunting and hiking under statewide regulations. The Ashland WMA in Lee County is almost entirely forested with extremely rugged, steep terrain and many high cliffs. Elevations range from 850 to 1,250 feet above sea level. Good to moderate populations of grouse, squirrel, furbearers, deer, turkey, and songbirds exist on the area. The hollow is surrounded by clifflines characteristic of this portion of the state. Several man-made waterholes provide habitat for many reptiles and amphibians. Visit this KY Department of Fish and Wildlife Hunting Regulations website. Also beware that surrounding property belongs to private groups and individuals so know where you are hunting and be aware that the Red River Gorge Climbers Coalition has purchased neighboring property for the conservation of rock climbing. Location & Size: Lee County; 2,506 acres. Elevation: minimum 816 feet, maximum 1236 feet. Area Habitat: mostly forest: open land 18%, forest 82%, wetland 0%, open water 0%. Off Kentucky HWY 11, north of Beattyville. From Slade at the (Bert T. Combs) Mountain PKWY take HWY 11 South 10 miles to the WMA on the right. Best access is from HWY 11 or from Fixer Road (to access ridges) or Cave Fork Road (to access the hollow). Directions from Beattyville: take HWY 11 North 7.0 miles to the WMA on the left. 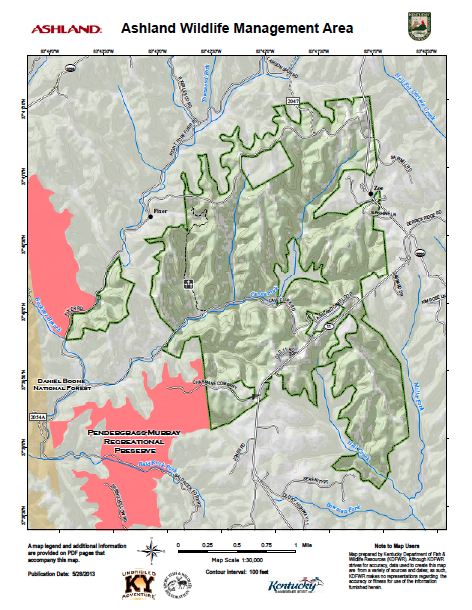 Ashland WMA lies in northern Lee County just south of Natural Bridge State Park and Red River Gorge. No ATV’s, camping, horseback riding, or rock climbing is allowed on the WMA. Public hunting is provided by an agreement between Ashland, Inc. and the Kentucky Department of Fish and Wildlife Resources. 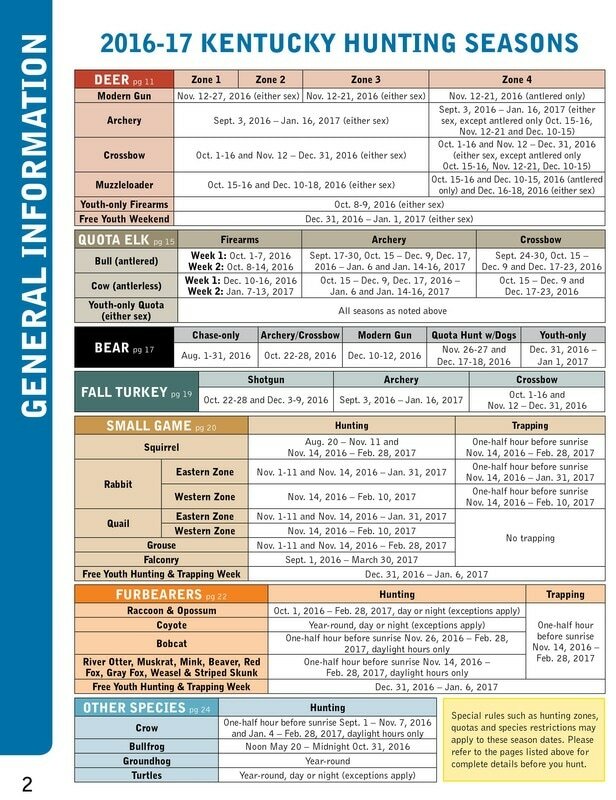 The area is open under statewide regulations for all game species.